Home > Causes of Pain > What are Peptic Ulcers? Stomach aliments come in many different forms and can have many different causes. 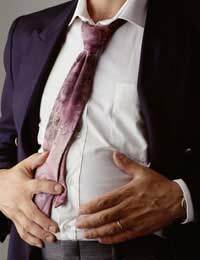 One of the more serious stomach conditions is a peptic ulcer. Peptic ulcers occur in the digestive system and can cause severe pain in the abdomen. Understanding the cause of this condition and the factors that can make the condition worse will help you control your symptoms or avoiding developing an ulcer all together. The word ulcer is used to describe an open sore. Peptic ulcers are open sores found in the lining of the digestive tract. These sores or erosions occur when the hydrochloric acids and enzymes in the gastrointestinal tract build up and attack the mucus lining or wall. These acids are usually responsible for breaking down food but can eat away the lining of the digestive track when overproduced. Once the lining becomes eroded the area is susceptible to further attack by stomach acids. When the acids attack the ulcer a burning pain is noticeable in the middle area of the abdomen. Without treatment the ulcer can become bigger and more painful with time.There are two main types of peptic ulcers: duodenal and gastric. Duodenal ulcers occur more commonly in men and in individuals between the ages of 30 and 50. Gastric, or stomach, ulcers are more common in women and those individuals over the age of 60. Although many theories have existed as to the cause of peptic ulcers, recent research points to a direct correlation between ulcers and the presence of the bacterium Helicobacter pylori, H pylori for short. H pylori may weaken the digestive tract's ability to defend itself against from harsh substances and digestive acids. However, you do not have to be infected with H pylori to develop an ulcer. Some ulcers are caused by other factors like medications and treatments used to fight disease. Whether or not a peptic ulcer is caused by the presence of H pylori or not, there are other factors that can contribute to the development of an ulcer. These factors can break down the lining of the digestive tract, weaken the body's immune system, or work to increase the acids released in the gastric system. In the presence of H pylori these factors can make ulcers worse or increase their development. When H pylori is absent these factors can contribute to the erosion of the digestive lining and promote the development of ulcers. Aspirin, anti-inflammatory medications, and medications for arthritis and cancer can weaken the immune system and promote erosion of the stomach lining. Some habits, such as smoking, consuming alcohol, and drinking beverages that contain caffeine, can increase your risk for developing an ulcer. These substances can increase the amount of acid released in the stomach and promote gastric lining erosions. Some medical conditions, like intestinal bleeding and heartburn, can increase your risk of developing an ulcer. These conditions affect the lining and function of the digestive tract and make it more susceptible to developing open sores. Finally, certain emotional problems and disorders, such as extreme stress and anxiety, can increase the occurrence of ulcers. Long periods of worry, agitation, or nervousness can cause the stomach to excrete excess acids that promote the breakdown of the stomach lining. Plus, long-term stress leads to the release of chemicals that impair the function of the immune system making the body more susceptible to infection and disease. Peptic ulcers can be painful and hard to cope with. Although treatment is available the best way to deal with these ulcers is to prevent their development in the first place.